In 1975, as part of the bicentennial celebration for our Nation, the Pleasanton Bicentennial Festival Committee was planning special projects and citywide events. This Committee was chaired by Charlotte Severin and included Bev Hamlin, Phyllis Wentworth, Betty Nastrand, Al Fisher, Patricia Maines, Barbara Van Slyke, Jim Allen, and B. J. Smith (just to name the group that had reunited annually at Christmas time). One of the projects of the Festival Committee was to make a bandstand in Wayside Park out of a concert platform and four posts that had stood as an unfinished eyesore for many years. When (then) City Council member Bill Herlihy heard about that project, he said to Charlotte, “Well, if you have a bandstand, what about a band?” Given the challenge at hand, Charlotte presented a plan to Mike Connelly, Director of the Amador High School Adult Education Program, and he agreed to co-sponsor the program, which included paying the first director Jerry Lapinski (the Music Director at Wells Intermediate School) a modest stipend from Adult Ed. Funds and allowing the Band to use the music and practice in the Amador High School Band Room. About 35 people signed up and the Band officially began as the Pleasanton Bicentennial Band, with practices every Thursday. The Band has changed names from the Pleasanton Bicentennial Band to the Pleasanton Community Band to the Pleasanton Community Concert Band. It is a non-profit corporation. The Year 2005 marked the 30th Anniversary for the Band, and also for the Festival Committee. The Band now has about 70 members, coming from as far away as Alameda, Brentwood, Fremont, San Francisco, and Stockton. Some musicians who played in the early years under Jerry Lapinski are with the Band today: Bob Butler, Yvonne Greilich, Chuck Smith, and Bob Williams. After the third year, Jerry Lapinski left the Band and Bob Williams became director from 1978 until 1982, when he took a leave of absence. Jay Roberts served for the next six years. Then, in 1989, Bob returned to lead the Band. The Band has attained a high level of excellence and a strong spirit of community. In 1999, the Band was invited to be a featured Band at the national convention of the Association of Concert Bands, and they received high praise from many in attendance. 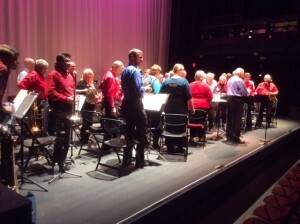 The Band has also been invited for the several years to perform at the Sacramento Valley Symphonic Band Association’s Festival in Carmichael, and the Band is repeatedly asked to play at local community events in the greater Tri-Valley area. These include the Department of Veterans Affairs Community Living Center in Livermore, the Masonic Home in Union City, Art Under the Oaks at Alden Lane Nursery in Livermore, the Ravenswood Historic Site Old-fashioned Ice Cream Social, the Pleasanton and Livermore Farmers’ Market, and Memorial Day, Fourth of July and Veterans Day Ceremonies. In addition, the Band holds three of its own concerts annually: Spring Concert, Children’s/Family Concert, and Holiday Concert. In 1999, the Band received a Special Recognition Award for Community Service from the Pleasanton Chamber of Commerce, and in 2000 Bob Williams was honored for his contributions. In 2003, Bob Williams and the Band were among the recipients of the Mayor’s Award to recognize commitment to the advancement of the arts in Pleasanton. The Band is sanctioned by the City of Pleasanton and is governed by an elected Board of Directors. The Band is a member of the Association of Concert Bands, the Pleasanton Cultural Arts Council, Livermore Cultural Arts Council, and Pleasanton Chamber of Commerce.